SCROLL down to see more Sixtieth Wedding Anniversary Ideas. All of Little Linda Pinda’s desings you see here can be put on any of our hundreds of personalizable gifts by world renown Zazzle. If you have an anniversary coming up for a friend or family member and would like me to create a gift for their year, feel free to give Little Linda Pinda a call: 239-949-9090 I can create it for any year anniversary in any color combinations. Front and Back view of these lovely Personalized 60th Wedding Anniversary Gifts Mug Set. Great Sixtieth Wedding Anniversary Gifts for Couples who have everything. Unique 60th anniversary gifts designed by Little Linda Pinda. I can design these with your colors, year and text. These gorgeous unique 60th anniversary gifts symbolize Two Hearts that become One. The front of the Lovers Mugs show the heart as one and the back as two separate hearts about to be one. 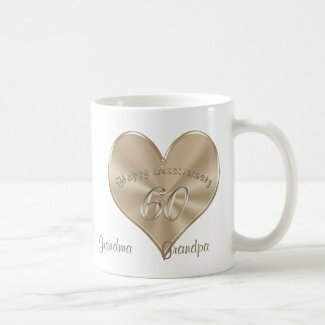 60th Anniversary Mugs for Grandparents or Change to any Couple’s NAMES. 3 text box templates to Change “Grandma Grandpa” on Front and Back or Keep it as you see it. Grandma and Grandpa will smile every time they look at these memorable anniversary mugs. Two lives became one as this heart represents this. Type in ANY NAME instead of Grandma and Grandpa or you can even delete it. Everyone can use an extra clock. Quality vibrantly printed anniversary clocks are so detailed and beautiful. I created a clock for my mom for a Mother’s Day gift. My brother, a genius inventor, was so impressed with the quality of these clocks. The printing is protected by a nice coating. All the clocks are available in Round (Large Or Small) and the Large Square Anniversary Clock, as shown. Happy 60th Anniversary Ornament. Type in Grandma and Grandpa on Back in Text Box Template. Click on the ornament to go directly to the ornament. 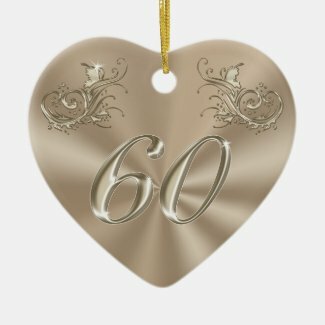 I’ve just created some lovely 60th anniversary gift ideas for grandparents or you can change Grandma and Grandpa to any couple’s names, their anniversary or wedding date(s) or any text you wish. You can also just delete any of the customizable text. Call, Little Linda Pinda and I will happily make changes to any of my designs. I can even change the year, colors etc to fit your needs. Let me know if you would like coordinating gifts for your 60th anniversary party. We have hundreds of items to complete your anniversary party for grandparents, parents and everyone you love. Porcelain Plates in 2 Sizes. Shown is the most popular 10.75 inch Anniversary Plate. Type in your Grandparents Name or the Name you have given your grandparents. At this moment, this is my most popular Personalized 60th Anniversary Gifts. I’ve created many, many more from Cheap 60th Anniversary Gifts to a bit more expensive, yet very reasonably priced for this quality and personalized. Give a beautiful 60th Anniversary Memory. Every Zazzle Gift is backed with a 100% Guarantee. A+ Rating from the BBB.org (Better Business Bureau) too. 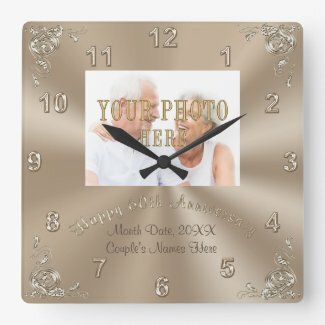 CALL Linda for Help or Changes to my original Sixtieth Wedding Anniversary gifts designs: We will create custom personalized 60th anniversary gifts for grandparents at no extra charge. What is the symbol for 60th Anniversary? Diamonds. I created these designs with a platinum look and some have stars representing the shine of diamonds. Your grandparents will love the special 60th anniversary memory you created them. By personalizing their gift, you are making it all the more special for them. Married 60 years is an occasion to really celebrate and make it memorable. The love they showed you as their grandchildren will live on for years in many lives. CLICK on this 60th Wedding Anniversary Category. Every part of everyone of my designs can be changed or put on any one of hundreds of personalized anniversary gifts by the year for any year. My mom and dad were not only an inspiration to us kids but to all their grandchildren as well. Many, many of our family members have said over and over how they inspired us and taught us how to love with the love or Jesus as their number one. They constantly were competing with who could do something for the other person. I loved going to their home and seeing all the cute love notes on the refrigerator, bathroom mirror and wherever they thought about expressing their love for one another. We really appreciate and want to Thank you so much for visiting our Personalized 60th Anniversary Gift Ideas for Grandparents article. If you have an idea and would like me to try to create it for you, give Little Linda Pinda a call. There are no extra charges for custom orders. Every single one of my designs or even parts of every design can be changed just for you. I have many more 60th Wedding Anniversary Presents personalized or not. I can create them in ANY COLOR for ANY Anniversary YEAR. 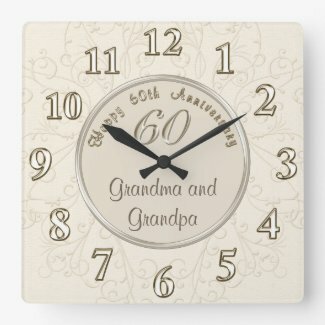 Many more unique 60th wedding anniversary gift ideas for grandparents, sixtieth anniversary presents for couples married 60 years. Personalize it or delete the temporary text or call Zazzle Designer Linda to make changes for you at no extra cost.